You are here: Home / Georgia / Dismas Charities Augusta Garden Grows! 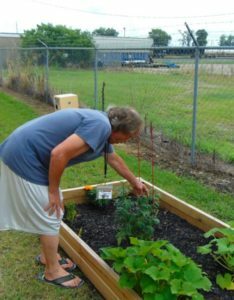 Resident Bill Cheney checks the progress of the squash in one of the two garden plots he cares for at the Augusta facility. When Cheney firs saw the two empty beds, he immediately asked if he could maintain them. Since then, reports Director Cheryl Frazier, Cheney has planted squash, peppers, zucchini, two types of tomatoes and flowers. “Mr. Cheney took nothing and made it what it is today,” Frazier said. “He takes extreme pride in the garden and nurtures it as if it were his child.” The produce will be used by the facility and in donations to senior citizens.